Sams runs on renewable energyand makes money doing it. To get people excited about the idea, Auken set up a competition between municipalities for the best plan for going carbon-neutral in 10 years. 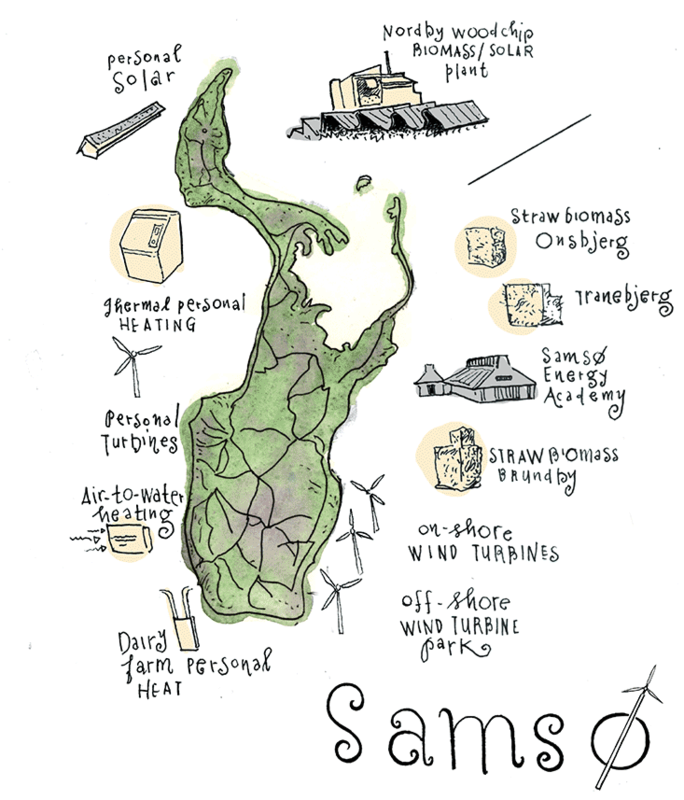 When Sams won, it became Denmark’s renewable-energy island.” Hermansen, then a teacher, rock musician, and self-described rabble-rouser, took it upon himself to see that his native island lived up to its new name. He brought consultantsand beerto community meetings to try to convince his neighbors, many of them conservative farmers, to take up the cause. But the consultants weren’t getting through. So Hermansen sent them home. Instead of telling people what they should do, I had to address the fear of change.” He told them that renewable technologieswind turbines, solar arrays, biomass plantswould bring jobs and, better yet, money. Through subsidies, the government guaranteed a stable price for wind-generated power for 10 years, meaning investors could recoup their costs after seven or eight and start making a healthy profit. That perked up their ears. Meeting by meeting, Samsingersfarmers, plumbers, schoolteachers, grocersbegan to band together behind the project. When it finally got off the ground in the late 1990s, Sams was putting 11 tons of carbon dioxide into the atmosphere every year. But by 2001, residents had cut their fossil fuel use by half. In 2003, they began exporting electricity to the mainland. Today the island produces from renewable sources 25 percent more energy than it consumes. What makes Sams’s story so remarkable, however, isn’t this fast transformation from carbon polluter to renewable-energy producer. It’s how it happened: Sams owes its success not to a collective environmental idealism, but to its residents’ brass-tacks business sense. The wind always blows here,” a grain farmer on Sams told me. The steady resource allows the island to generate around 105 million kilowatt-hours per year with 11 land turbines, 10 offshore ones, and a smattering of micro-models. Residents use only about 24 percent of this electricity. They sell the rest. Listening to the low drone of his turbine now, he says, he hears the music” of income. Sams Golfklub, tucked in the island’s northeast corner, is a kind of microcosmic showcase of the community’s embracement of sustainability. The club’s carts and mowers are solar-powered, and golfers carry hand-held weeders so they can do spot maintenance as they play.